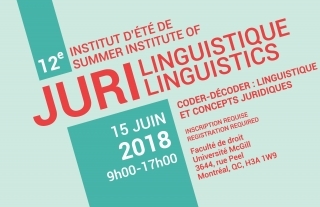 The Crépeau Centre, in collaboration with the Network of Jurilinguistics Centres, is organising the 12th Summer Institute of Jurilinguistics on 15 June 2018, at McGill University’s Faculty of Law in Montreal, Canada. The theme of this year’s Institute is “Coding/Decoding: Linguistics & Legal Concepts”. This Summer Institute will focus on the significant role that the different aspects of linguistics play in our understanding and use of legal concepts, particularly the capacity of linguistics to respond to the need for access to justice. The ever-evolving nature of concepts, especially in the context of linguistic and legal pluralism, adds a particular dimension to the fundamental mission of jurilinguists, which is to code/decode concepts. How can linguistics help construct a legal discourse that is accessible to litigants? How might linguistics be a tool for legal certainty? Such issues will be discussed through the lens of the different themes that will be explored during the day. You can consult the programme and find out more about registration, accommodation, etc., at the conference webpages. All information is also available in French by changing the language at the top right of the McGill website.